Jesus seems to have a special love for lost people. I love the stories He tells in Luke 15. The first is the beloved story of the shepherd who has a hundred sheep but leaves the ninety-nine to look for the one that is lost. Then when he finds his lost one, he calls in his neighbors and friends to rejoice with him. Jesus seems to have a special love for lost people ... This makes me think of the criminals executed with Our Lord Christ. They certainly were the lost sheep, ...the lost coins, ...the lost sons...and Jesus came to seek them. They obviously had been running away from God...who knows what kind of crimes they had committed! The Bible just calls them "criminals" [thieves, malefactors KJV]. Maybe God didn't come into their thinking...but that's the point. They had gone their own way. Truly I say to you, today you will be with Me in Paradise. Luke 23:43Jesus seems to have a special love for lost people. I love the stories He tells in Luke 15. The first is the beloved story of the shepherd who has a hundred sheep but leaves the ninety-nine to look for the one that is lost. Then when he finds his lost one, he calls in his neighbors and friends to rejoice with him. The second story is of a woman who has 10 coins but loses one. She is so distraught that she searches high and low for it. When she finds the coin, she calls in her neighbors to rejoice with her. The last story is of a father who had two sons. One of the sons decided to go his merry way, away from his father's love and provision. The son then squandered his inheritance with loose living in the far country. The father never stopped watching for and longing for his beloved son. So when the lost son finally came home, his father threw a party so all could rejoice with him. I tell you that in the same way there will be more rejoicing in heaven over one sinner who repents than over ninety-nine righteous persons who do not need to repent...I tell you, there is rejoicing in the presence of the angels of God over one sinner who repents...we had to celebrate and be glad, because this brother of yours was dead and is alive again; he was lost and is found. This makes me think of the criminals executed with Our Lord Christ. They certainly were the lost sheep, ...the lost coins, ...the lost sons...and Jesus came to seek them. Of all the possible condemned criminals in the Roman world (and there were many!)... 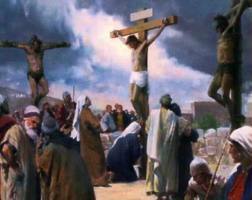 through all the centuries that Rome practiced the cruel punishment of crucifixion... God in His sovereignty placed those two, side by side...with the SON OF GOD! And this, at the time of the victorious Crisis of the Ages -- the redemptive death and resurrection of Christ! Hardly a coincidence! But of the two hanging there next to the Son of God, only one was saved! What made the difference? So one desperate, believing lost one was found...captured by the seeking, pursuing Lover of Sinners! We all go our own way -- wandering off and needing God's rescue. And we're all faced with a choice (as these two criminals were), God's salvation or our own. Yes, even as believers, "saved ones." The Divine Pursuer is always on a "Rescue Mission"...sovereignly orchestrating our circumstances (as He did for the thieves on the cross) so we can encounter HIM in new and life-giving ways. He rescues us from our self-centered attitudes and ways of doing life [SIN]. Where in your life today, dear friend, is the Divine Pursuer seeking you out, perhaps even shouting at you? Is it in your relationships? ...in your finances? ...in your attitudes and thought life? ...in your health? ...in the health crises of loved ones? ...in _______[fill in the blank]_____? Call out to HIM in your distress...TODAY! O sacred Head, now wounded, with grief and shame weighed down, now scornfully surrounded with thorns, thine only crown: how pale thou art with anguish, with sore abuse and scorn! How does that visage languish which once was bright as morn! 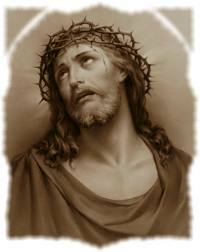 What thou, my Lord, has suffered was all for sinners' gain; mine, mine was the transgression, but thine the deadly pain. Lo, here I fall, my Savior! 'Tis I deserve thy place; look on me with thy favor, vouchsafe to me thy grace. What language shall I borrow to thank thee, dearest friend, for this thy dying sorrow, thy pity without end? O make me thine forever; and should I fainting be, Lord, let me never, never outlive my love for thee. Salvation is much more than just going to heaven when we die...and just doing the best we can in the meantime.Salvation is the NT Greek word sozo. In its broadest sense, sozo means "to save, to deliver, to preserve safe from danger, loss, destruction, to make whole." I am saved from__________________________ (vs 4-5). See also Rom 6:23. I am saved for_______________________(vs 10).